Nailah Winkfield, who refused to accept California doctors' declaration that her daughter was brain-dead, said she kept up her fight because of her faith. 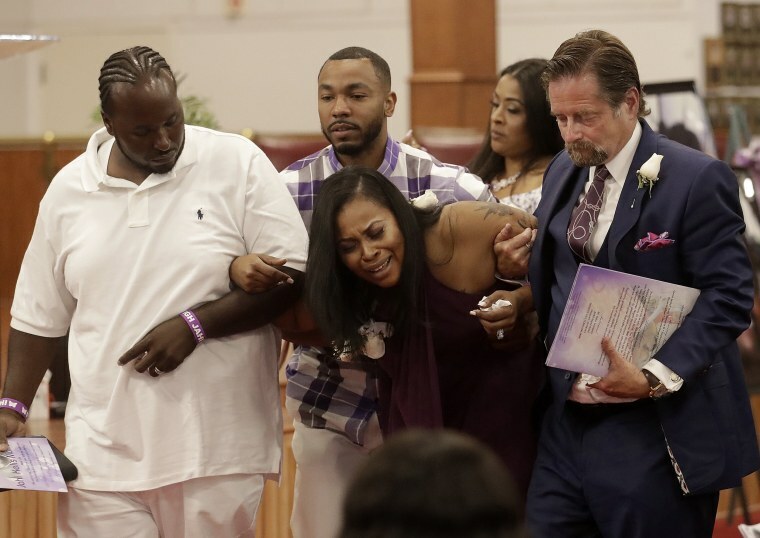 The congregation at Acts Full Gospel Church in Oakland gave Winkfield a standing ovation on Friday for fighting to keep her daughter on life support and taking on the medical establishment in the brain death debate between science and religion. A California coroner issued a death certificate in January 2014 for Jahi McMath, then 13, after doctors said she died of irreversible brain damage during a routine surgery to remove her tonsils in December 2013. Winkfield refused to accept the California doctors’ conclusion and took her daughter to New Jersey, a state that accommodates religions that don’t recognize brain death. The girl was kept on life support and received nursing care until New Jersey doctors declared her dead on June 22, saying McMath, then 17, died of excessive bleeding after an abdominal operation. New Jersey doctors issued her death certificate the same day. Winkfield has filed two lawsuits in California, both of which seek to invalidate the state’s death certificate. Winkfield’s attorney, Chris Dolan, said the New Jersey death certificate should strengthen Winkfield’s legal position. She is suing the doctors and Children’s Hospital of Oakland for medical malpractice, alleging that surgeons botched what should have been a routine tonsillectomy. Damages in California for so-called non-economic harm in medical malpractice cases for pain and suffering and the like are capped at $250,000 when the patient dies. The hospital and Winkfield were wrangling over that in court when New Jersey issued its death certificate. Dolan has also filed a federal civil rights lawsuit, which seeks to invalidate California’s death certificate. Winkfield said at the funeral service that she kept up her fight because of her deep Christian belief that her daughter was alive and could respond to her name being called and simple commands to wiggle a finger or toe. She criticized the doctors who insisted that her daughter was dead and said she was fighting to eliminate “brain death” as a diagnosis. New Jersey’s Medicaid program, donations and family members paid for the girl’s care. Winkfield said she sold her California home and drained her savings to keep her daughter on life support. During the service, Winkfield was lauded for her determination and strength to disagree with California doctors. McMath's body was taken to nearby Hayward for burial.